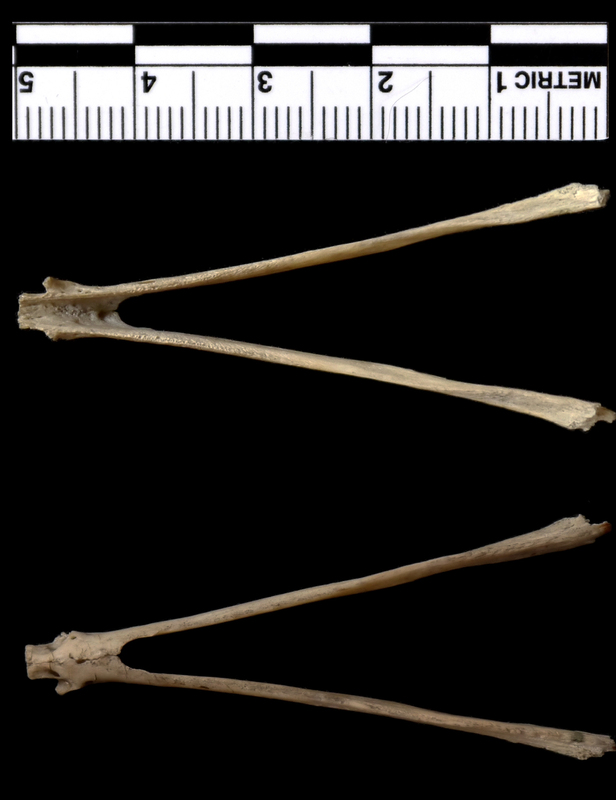 It led to a lot of speculation on Facebook and Twitter, with ideas including a bird wishbone, hyoid or mandible. However, the comments on the blog tended to be a little more focussed in the area of the mandible of an ant-eating mammal. Anatomical and zoological researches: comprising an account of the zoological results of the two expeditions to western Yunnan in 1868 and 1875; and a monograph of the two cetacean genera, Platanista and Orcella. John Anderson, 1878. So it appears from the morphology of the premaxilla, zygomatic region and nasals that this is a Sunda Pangolin, Manis javanica Desmarest, 1822. These unusual scaly insectivores are critically endangered due to poaching for their meat, skin and scales for the Chinese market, with their population suspected to have declined by 80% in the last 20 years, despite having a protected status. Sad to say that their ability to roll into an armoured ball does nothing to protect them from people. If you’re not a fully paid-up bonegeek, you might like to have a bit of an additional clue; if so, click here. Please keep your answers in the comments section cryptic, so everyone gets a chance to have a go at working it out without spoilers. Have fun! It’s another distinctive one, but I’m guessing that it may not be familiar to everyone. So as usual, please keep your suggestions cryptic so everyone gets a chance to have a stab. When I first saw it I assumed it was a Macaque of some kind. It’s obviously in the Cercopithecidae (or an Old World Monkey) based on the number of premolars – 4 in the upper jaw instead of the 6 you’d get in a Platyrrhini (or New World Monkey). Macaques are common in collections and they have a similar overall appearance to this specimen. 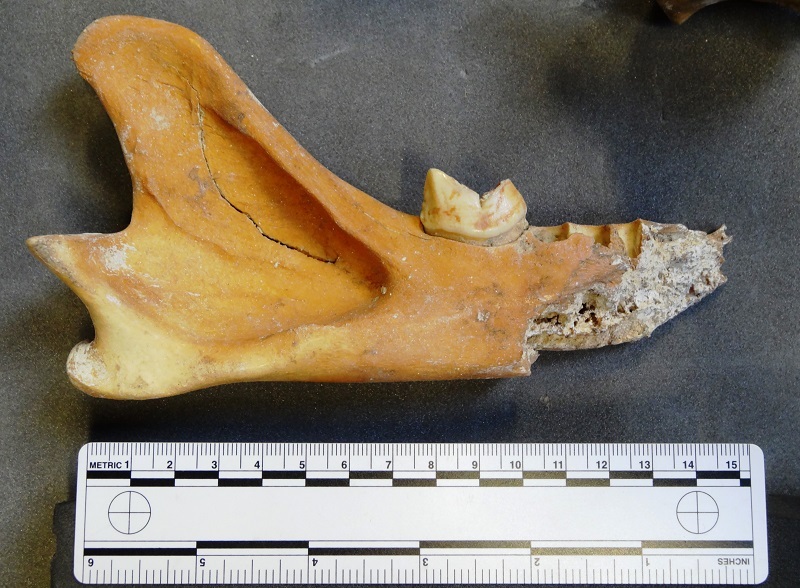 However, I then noticed the particularly deep hollows under the eyesockets and the flaring of the maxilla where it meets the nasals, which is not a characteristic of Macaques. It actually reminded me a bit of a toned down version of a Mandrill skull, so I started by looking at the phylogeny of primates to get an idea of which species were more closely related to the genus Mandrillus. As you can see the Mandrills share a sister relationship with the genus Cercocebus, which are the White-eyelid Mangabeys, so that’s where I started looking. It turns out that these infraorbital depressions are a Mangabey feature, so I then looked at the various types of Mangabey (not just those in the genus Cercocebus). It wasn’t easy finding specimens for comparison, but I did find a very useful (if a bit old) paper on Mangabeys by Groves (1978), which gave good descriptions of the various species, allowing me to rule out the Sooty Mangabey and narrow the likely species down to the Golden-bellied Mangabey or, my personal preference, the Agile Mangabey Cercocebus agilis (Milne-Edwards, 1886). These monkeys have a shorter, relatively broader face than the more familiar Sooty Mangabey, with deeper and broader hollows under the orbits. 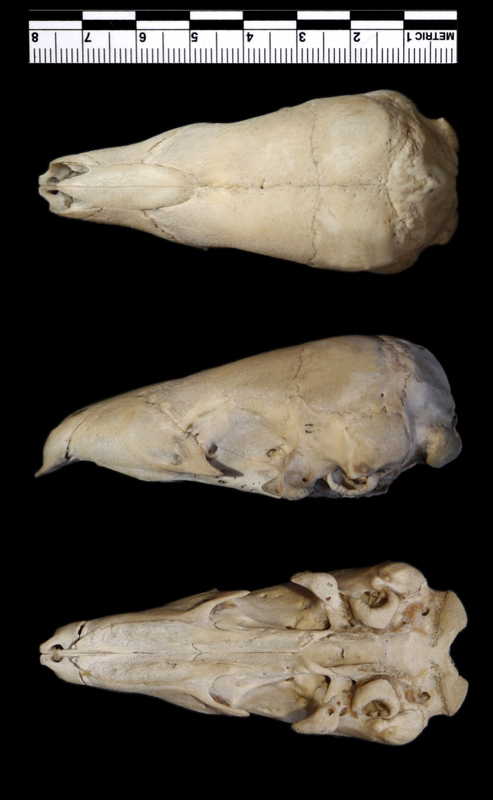 So well done to everyone who recognised that this skull belonged to an Old World Monkey, with particular congratulations to Cindy Nelson-Viljoen and palfreyman1414, who all came close in terms of taxonomy and a big round of applause for inkydigit who narrowed it down to the right genus! 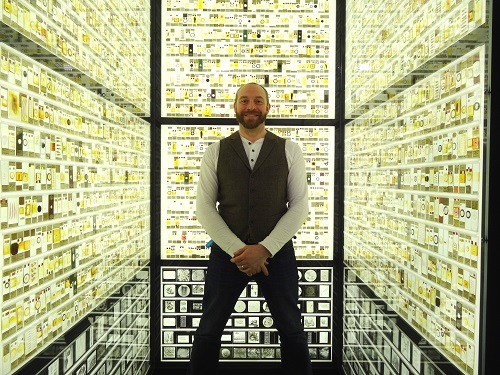 As I’ve mentioned a few times, I have recently started a new job as Curator of the Grant Museum of Zoology at UCL. If you’ve never visited, you should pop by, and if you have visited then why not vote for us in the Time Out Love London Awards, preferably right now, since voting closes today. I’d love it if we could beat our heavyweight neighbour, the British Museum! 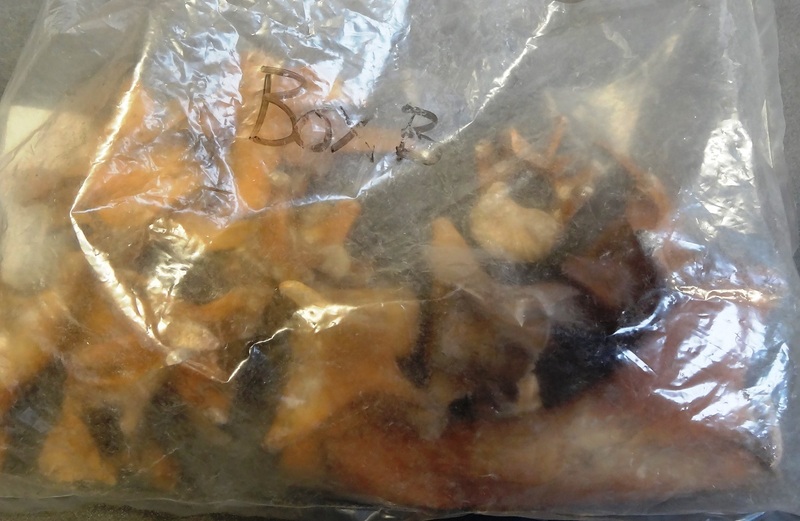 This bag-o-bones came to us from the Royal Free Hospital and was completely sealed up, making it hard to see inside. For those of you who like a challenge I’ll leave you with just this image, but if you’d like a slightly less tricky image to work from, you can see the single most distinctive part of the specimen here. Do you have any idea what it might be? It’s pretty easy if you check out the distinctive bit, so please keep your answers cryptic if you can! Oh, and if you like skulls, you might be interested in my first Specimen of the Week on the Grant Museum blog. 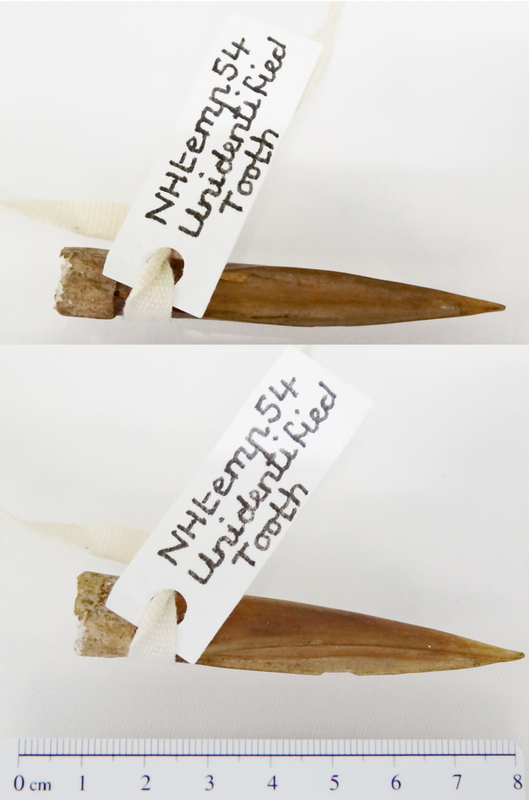 There were a variety of suggestions as to what it might be, but everyone (correctly) discounted the information on the label that it was a tooth. There were some suggestions of wood and ivory, but there were two suggestions which were definitely in the right ball-park. Daniel Calleri suggested it might be something fishy, while Krista got it pretty much spot on when she suggested a dorsal barb from a skate or ray. I’m pretty sure that it’s the spine from the leading edge of the first or second dorsal fin of a Spurdog shark in the genus Squalus Linnaeus, 1758. These turn up every so often in collections, sometimes as decoration, sometimes as items found in Native American middens. Presumably they’re composed of keratin, which is a commonly occurring structural protein in vertebrate skin that can also form hair, horn, scales and claw. Thanks for all your comments and well done to Krista! It’s been a hectic couple of weeks and I almost forgot the mystery object again because I lost track of the days! I was hoping to use an object from my new job at the Grant Museum of Zoology today, but I never got the chance as I’ve been zipping around all over the place. Yesterday for example I was at the lovely Royal Albert Memorial Museum (RAMM) in Exeter, delivering a training session on identifying natural materials. Any idea what this might be? If you want more information about it, just ask in the comments and I’ll do my best to reply. Have fun!